05/27 Update: Several Sources report that the “large U. S. Defense contractor” hit by the alleged compromised seeds attack could be Lockheed Martin. A bolt from the blue! Source report some details of the alleged first attack to a very large U. S. Defense contractor perpetrated by mean of compromised RSA seeds. Late on Sunday all remote access to the internal corporate network was disabled. All workers were told was that it would be down for at least a week. Folks who regularly telecommute were asked to come into nearby offices to work. Then earlier today (Wednesday) came word that everybody with RSA SecureID tokens would be getting new tokens over the next several weeks. Also, everybody on the network (over 100,000 people) would be asked to reset their passwords, which means admin files have probably been compromised. 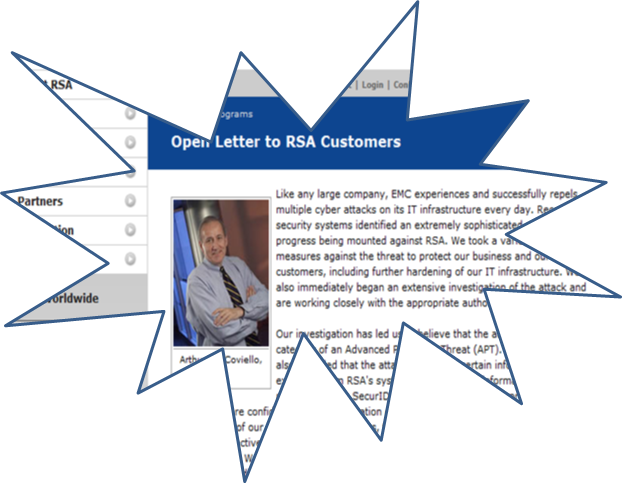 It seems likely that whoever hacked the RSA network got the algorithm for the current tokens and then managed to get a key-logger installed on one or more computers used to access the intranet at this company. With those two pieces of information they were then able to get access to the internal network. Fortunately the contractor was able to detect the breach and to manage it, avoiding worst consequences. But many questions remain unsolved: was this the first attempt? Were all the seeds compromised during the famous breach? For Sure it will not be the last and my sixth sense and one half thinks we will have to get used to this kinds of attacks.